Add gifts from any website. Share with anyone. With Gift Hero you can keep everything you want in one place from any device. Your big day comes once a year, make it the best one yet! 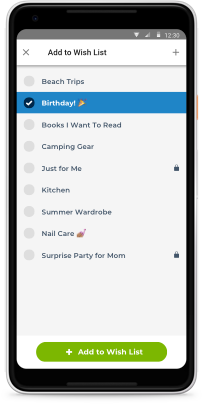 Create a Birthday Wish List, adding anything from anywhere, and share it with those you love best. No matter when your favorite holiday comes, you can create a Wish List and add to it all year long. With Gift Hero, you can add anything from anywhere. Create your wedding registry on Gift Hero and add anything from anywhere. Why limit yourself to one store when you can blissfully have it all in one place? Create your Baby Registry on Gift Hero and add anything from anywhere. Why limit yourself to one store when you can have it all in one place? If you've got a crush and want to win them over, try searching for their Wish List. Cupid's arrow hits the target every time with a little help from Gift Hero! Start your wish list today! Celebrate your success! Create a Wish List and add things that will help launch you into the next phase of life -and share with family and friends. No matter what your cause, you can add any item from any site. Showing your donors exactly what you need allows them to give with confidence and joy! Whether celebrating your 1st or 50th, creating a Wish List on Gift Hero is the best way to let your loved one know what gifts make your heart skip a beat. Skip boring and cookie cutter corporate gifts and go straight for the bottom line. Get the gifts your employees really want with a Gift Hero Wish List! Always buy a meaningful and appreciated gift. Useless and unwanted gifts bum everyone out. Get the perfect present. It’s better for you, them, and the environment. 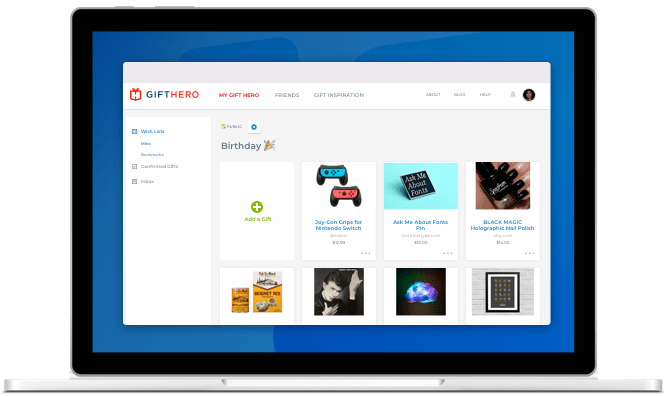 Gift Hero makes sharing a wish list super simple.